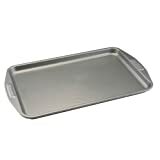 Our larger cookie pan gives you more room for your baked goods. Budget permitting, consider buying two cookie sheets of the same type. As different pans yield different results, matching pans helps produce a uniform batch of cookies and allows you to keep one pan in the oven while you’re cooling the other, thus speeding the baking process.